For a more immediate response: Take 1 hour prior to physical activity. 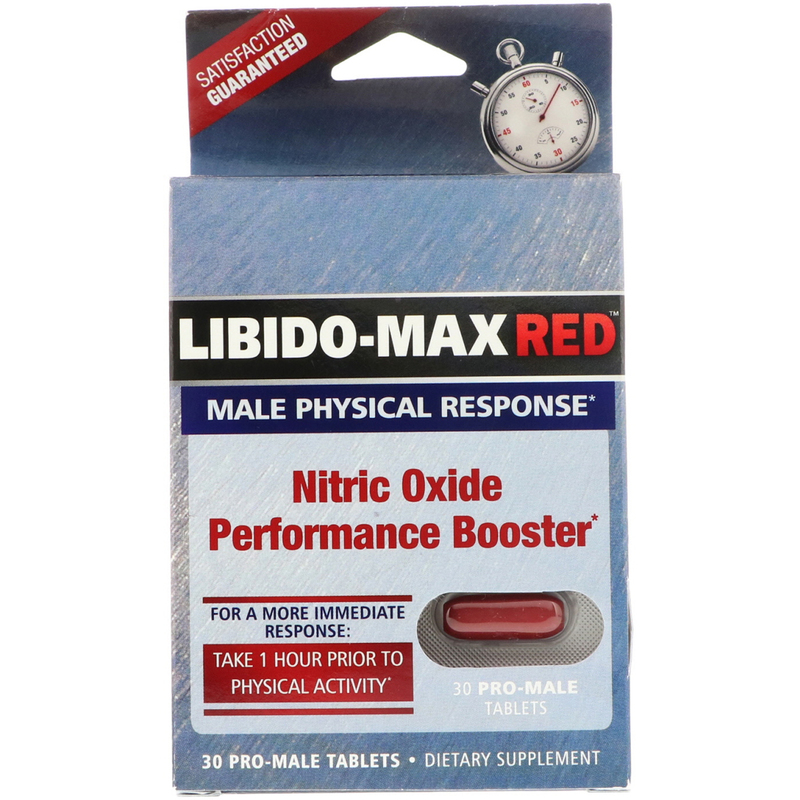 Use both together to maximize results: Libido-Max for enhanced performance and vitality boost. Libido-Max Red to support blood flow & male physical response. (Adult) Take two (2) tablets twice per day as needed. For a more immediate response, take four (4) tablets one hour to sexual activity. Do not exceed four (4) tablets per day. Dibasic calcium phosphate dihydrate, microcrystalline cellulose, stearic acid, croscarmellose sodium, magnesium stearate, silicon dioxide, sodium carboxymethylcellulose, dextrin, dextrose, soy lecithin, sodium citrate, polyvinyl alcohol, polyethylene glycol, fd&c red #40, talc, titanium dioxide and fd&c blue #2. Usage Warnings: Do not use if safety seal is broken. 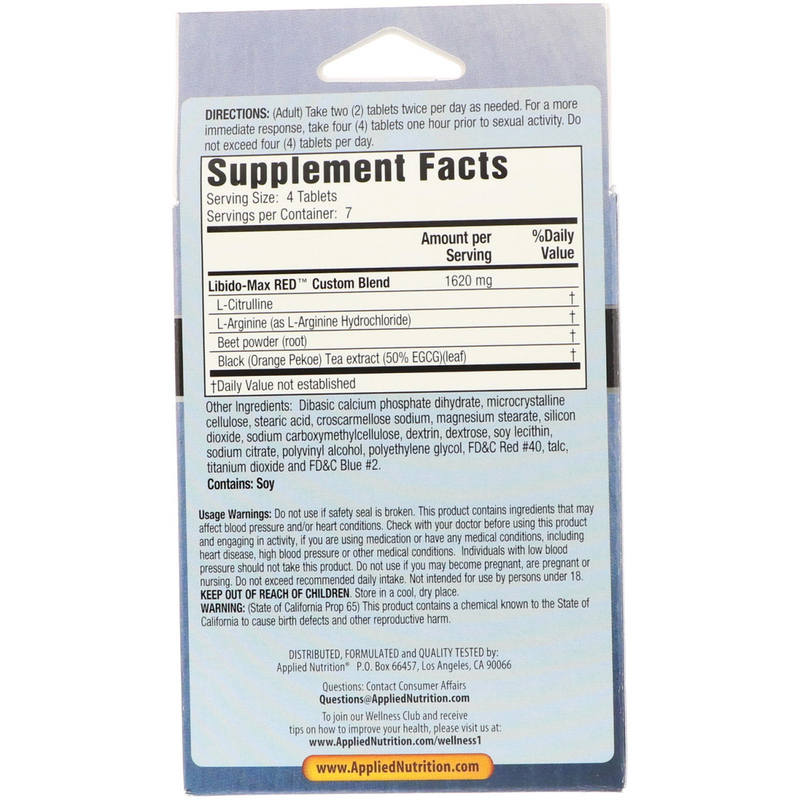 This product contains ingredients that may affect blood pressure and/or heart conditions. Check with your doctor before using this product and engaging in activity, if you are using medication or have any medical conditions, including heart disease high blood pressure or other medical conditions. Individuals with low blood pressure should not take this product. Do not use if you may become pregnant, are pregnant or nursing. Do not exceed recommended daily intake. Not intended for use by persons under 18. Keep out of reach of children. Store in a cool, dry place.